See the scenic and wild north coast of San Francisco and the Golden Gate on this memorable walking tour. Our easy-going, half-day walking tour along San Francisco' romantic Lands End is infused with nature and California history, and led by expert local guides as we follow along the beautiful, unspoiled coast of the City's northwestern edge. Meander along coastal foot paths and trails to hidden beaches, rocky bluffs and views so naturally stunning you will forget that a major city is directly behind you. Dip your feet in the Pacific and enjoy the fresh salt-air and brisk ocean breezes. Photographers will love the panoramic views of the Golden Gate Bridge, San Francisco Bay and the high bluffs of the Marin Headlands. Depending on the season, you can see whales, porpoises, raptors, harbor seals and native wildflowers. Our San Francisco Lands End walking tour will be the best miles you'll ever enjoy on foot! We meet at the Lands End Lookout Visitor Center before heading out on an exploration of the historic ruins of Sutro Baths. 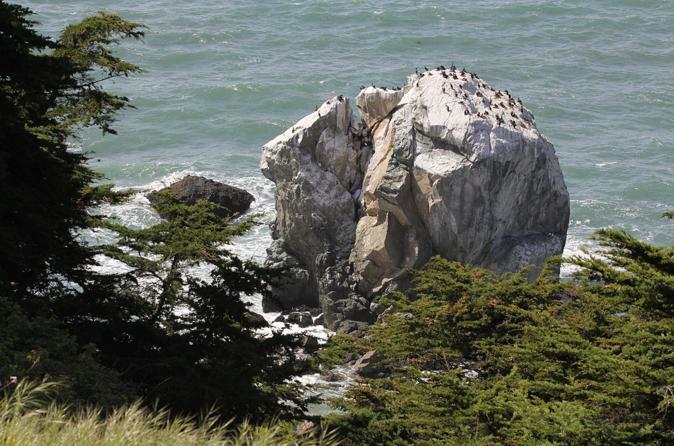 Take in views of Point Lobos and the grand archway of Seal Rocks just offshore. We climb from the Baths up to Sutro Heights Park and gaze upon broad Ocean Beach, with vistas stretching for twenty miles. Continuing on, we head along the rugged, cliffside bluffs where several shipwrecks can be spotted just offshore. Listen for the bark of sea lions, scan the sea for pods of dolphins or, with luck, the spout of a migrating gray whale. If you're a birdwatcher, bring your binoculars, as over 250 species of birds can be spotted along this path, including Brandt's Comorant and Anna's Hummingbird. We pass the stately Legion of Honor art museum in Lincoln Park and picnic mid-route before looping back to the Lands End Lookout Visitor Center, concluding our tour.